Can you believe my daughter is almost a year old? Holy cow, where did the time go? Tomorrow is her first birthday, so of course we are throwing a party. And yes, the menu will be all Rachael Ray recipes. I'll make sure to share the result next week. Just think good thoughts for me as I try to deal with the fact that my baby is growing up (did I mention she's walking now??). For a little Friday fun I included a picture from a couple months ago at the bottom of this post. Lanaann of Never Enough Thyme made Oatmeal Cookie Pankcakes from Every Day with Rachael Ray. Rebecca of Playful Noshings made Garlic Sliced Steak with Watercress and Horseradish Baby Potatoes. 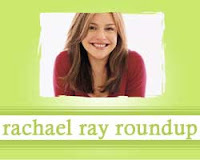 April of The Fragrant Hand wants Rachael Ray's magazine to be available on the Kindle. I have Kindle envy! Kristin of Sogkonnite Living made Tortellini Vegetable "Lasagna." That one's an oldie but a goodie from my favorite Rachael Ray cookbook - 30-Minute Meals 2. Jag of Recipes to the Test was not impressed by Rachael's recipe for Texas Turkey Chili. I would recommend her Uptown Down-Home Chili as an alternative. Diana of The Yummy Blog made Ground Gyros. Johanna of Dazzle Dish made Chicken Vegetable Nachos. The Pepper Tree reveals that Rachael's recipe for Polenta with Kale and Portobello Mushrooms is surprisingly good. The Domestic Empress discusses her experience as an audience member at Rachael Ray's talk show. Mommy's Kitchen features one of my all time favorites - Janet's Chocolate Chip Coffee Cake. Make it for your Easter Brunch! I loved it. Check out a review of Rachael's recipe for Chipotle Cashew Chicken at Food for Thought. Here's my review, too. They don't get sweeter than that! I wish you guys lived closer to me, because I would love to do a photo shoot of darcy for you! :) (photography is my hobby and side job!) she's so adorable. I can't believe she's a year old already!!! Such a cute little monkey!